I hope that you didn't think that just because Fourth of July was over that my blue and white kick would get under control since that is far from the case. I am so excited to introduce y'all to a new-to-me clothing brand that I have quickly fallen in love with. Sailor-Sailor is a women's lifestyle brand with the mentality that "summer lives all year long," a motto I could definitely get behind! 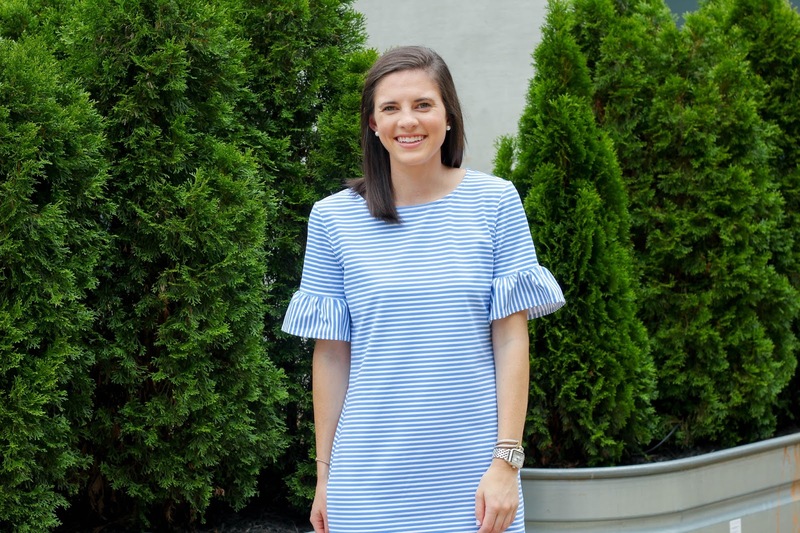 I've had the best time looking at the different pieces they sell and was quickly drawn to this blue and white striped dockside dress. 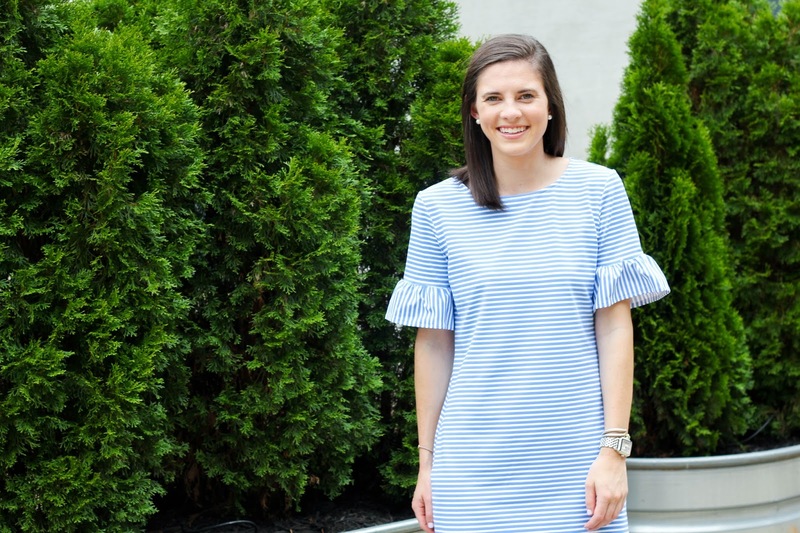 It is so effortless while looking put together and I know that this will most certainly become a staple when it comes to teaching clothes since it is the perfect length. While the over all style is hard to beat when I got this dress out of the box I was immediately so impressed by the material it is made from. It feels similar to that of a bathing suit with a good amount of stretch while still being soft. Talk about the perfect dress to beat the heat of the summer that is bound to come as July is now in full force. 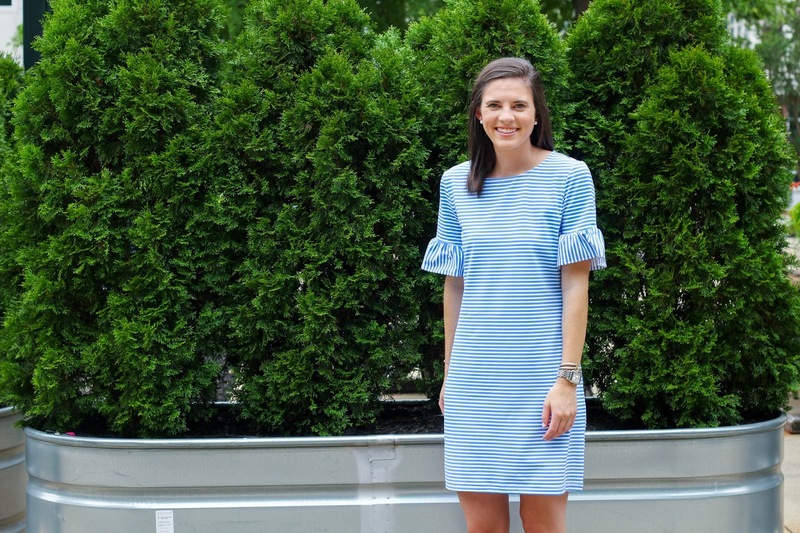 To keep my outfit comfortable I opted for a pair of espadrilles I purchased last summer and I love the way the brown compliments the blue and white of the dress. After throwing on my everyday accessories I realized just how perfect this would be to pack on a beach trip to rely on for a nice dinner after spending the day in the sun when the last thing you want to think about is attempting to look put together. Today and tomorrow I'll be playing catch up on emails and blog related things so that next week I'll be back in full force with some really exciting posts. I hope y'all have a great Thursday! Loving the brands logo. Summer forever is something I could get behind too! If only! The dress looks like a more fun version of a simple t-shirt dress. It's cute! This dress is so cute! I love the simple stripes! How cute are those sleeves!!! This is SO cute! Would be perfect for casual summer weddings. This dress is SO cute- I love the ruffle! Adorable dress! I wish summer was all year round in Michigan!